These famous words pronounced by Raul Castro in commemoration of Haiti 210 years independence. "We will not forget this remarkable historical coincidence that today 1. 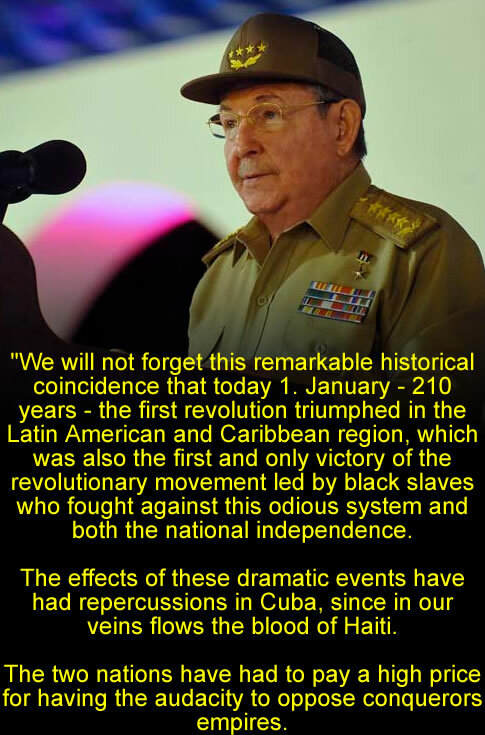 January - 210 years - the first revolution triumphed in the Latin American and Caribbean region, which was also the first and only victory of the revolutionary movement led by black slaves who fought against this odious system and both the national independence". Cuban medical teams have played a great role in treating Haiti's earthquake victims. Cuban Medical Internationalism is a Cuban programme, (since the Cuban Revolution in 1959, as part of Fidel Castro's international medical mission) of sending Cuban medical personnel overseas, particularly to Latin America. They were the first to arrive in Haiti with several hundred health personnel. The Cubans, immediately after the earthquake, had set up medical camps among the debris and revamped the collapsed hospital facilities very quickly. The Cuban doctors, nurses, and other health personnel had worked day and night non-stop, Operating rooms were opened 18 hours a day. However, it is a striking fact that there was little mention in the media that Cuba had sent several hundred health personnel on the ground before any other country. Dr Mirta Roses, the director of the Pan American Health Organisation (PAHO) who acted as the coordinator between the Cuban doctors, the International Committee of the Red Cross (ICRC) and a host of health sector NGOs, had described the aid provided by Cuban doctors was "excellent and marvelous". In the recent past, a medical brigade of 1,200 Cubans has operated all over the earthquake-torn and cholera-infected Haiti. They have treated over 30,000 cholera patients (around 40% of the total cholera patients) in Haiti. Since 1998, Cuba has trained 550 Haitian doctors for free at the Escuela Latinoamericana de Medicina en Cuba (Elam). Presently another 400 students are receiving free medical education in Cuba.